Starz is breaking up Droughtlander with the first look at the upcoming fifth season of Outlander. The network announced production is now officially underway on season five in Scotland. The announcement was accompanied by a smiling photo of Sam Heughan and Caitriona Balfe as Jamie and Claire Fraser. According to Starz, Outlander season five will consist of 12 episodes and is based on the fifth book of Diana Gabaldon’s bestselling Outlander series, The Fiery Cross. 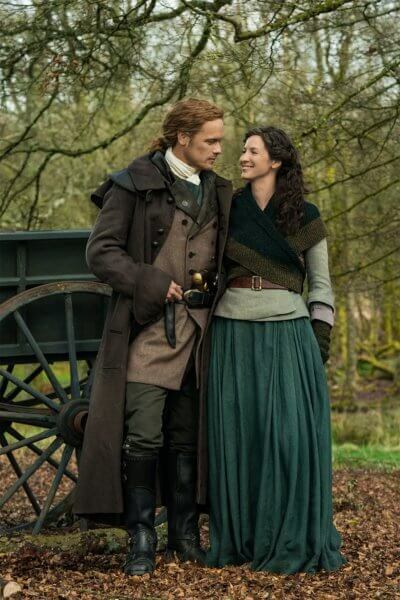 Outlander, which is confirmed to run through at least season six, is executive produced by Ronald D. Moore, Maril Davis, Matthew B. Roberts, Toni Graphia, and Andy Harries. The series is a Tall Ship Productions and Left Bank Pictures production in association with Sony Pictures Television. In addition to Heughan and Balfe, the cast includes Duncan Lacroix as Murtagh Fraser, Sophie Skelton as Brianna Randall Fraser, Richard Rankin as Roger Wakefield, John Bell as Ian, Lauren Lyle as Marsali, and César Domboy as Fergus. The Frasers of the Ridge are here! The fifth season of Outlander sees a continuation of the Fraser family’s adventures, as they navigate the trials and tribulations of life in colonial America. Establishing a home in the New World is by no means an easy task – and protecting it proves even more difficult – particularly in the wild backcountry of North Carolina, during a period of dramatic socio-political upheaval. As Claire knows all too well, friends, neighbors and countrymen are unwittingly marching towards Revolution, with members of the elite ruling classes struggling to stifle the alarming undercurrent of unrest triggered by the Regulator Movement. Against this backdrop, which soon heralds the birth of the new American nation, Claire and Jamie are forced to ask themselves just how far they are willing to go to protect their home, and praying there will be no reason to light the “fiery cross,” an ancient Scottish call to arms.